This story actually has its’ beginnings on the night of April 23rd, 1945. Six young British airmen from 644 Squadron, based at Tarrant-Rushton, England, take off at 19:51 hrs in their almost new Halifax A Mark VII, serial number NA337, to drop arms, ammunition and other supplies to the Norwegian resistance. They are one of two planes to leave that night for this mission; however, they are not fated to return. After successfully dropping their load of needed supplies, they are hit by anti-aircraft fire at approximately 01:45 hrs on April 24th, while overflying the important railway bridge at Minnesund, which lies at the southernmost end of Lake Mjøsa. With both starboard engines and the fuel tanks on fire, the pilot, Flight Lieutenant Turnbull, decided to turn north and find a good place to ditch his wounded bird. The rest of the crew moved to the crash station between the forward and rear wing spars as he headed up the east side of the lake and passed over the city of Hamar, before turning south again and ditching about a kilometre from shore at approximately 02:00 hrs. The ice had just recently come off the lake, but it was covered in thick fog. The ditching was a rough one and the tail section, with the rear turret, snapped off almost cleanly. The crew survived the ditching, however only the tail gunner, Flight Seargent Thomas Weightman, was ever to see England again. The life raft failed to deploy properly and most of the crew probably made a futile attempt to swim to shore. F/S Weightman, who had been knocked unconscious during the ditching, found himself engulfed in pitch black darkness and chest deep in water. Just able to climb out of the sinking Halifax and atop the capsized life raft, the only sounds he heard were those of the wind and the waves. For five hours he lay atop the life raft in freezing temperatures, and in the gathering light he eventually saw someone on shore and called out to him. He was eventually rescued and taken prisoner shortly thereafter. The bodies of four crew members were pulled from the waters that morning, however; the body of the flight engineer, Flight Seargent G. Basett was not recovered and he was presumed to have gone down with the plane. Two weeks later, on the 8th of May, 1945, the Nazi occupation troops in Norway finally capitulated. Remarkably, this was the second time that F/S Weightman was the only survivor in the crash of a Halifax. 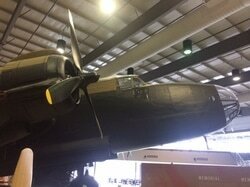 My involvement in this story began in mid July of ‘95, when I was informed that I would lead a team of maintenance technicians to Norway to recover the only intact Halifax bomber in the world. You can imagine how proud and happy I was to be selected for this once in a lifetime mission. I spent the next three weeks making plans and gathering the information we would need to acomplish our mission. By the ninth of August I was on my way to Oslo, Norway on a Recce to arrange accommodations, transportation and finalize all the loose ends regarding our work site at the HIAS Sewage Treatment plant. During this time, DACON, the underwater salvage team was also busy and on the 12th of August, the tail section was raised and being held underwater in a shallow bay. On the 15th, I finally met Karl Kjarsgaard when I picked him up at the airport in Oslo and we drove to a small bay near the village of Stange to see the tail section as it was lifted out of the water and put on a flatbed truck. Meanwhile back in Trenton the rest of the "The Recovery Team", consisting of 11 other members from 8 Wing Trenton, was busy putting together the supplies and equipment required for this unique and challenging mission, and becoming very restless to get under way. Finally on the 21st of August, they departed from Trenton, and after experiencing a technical problem in 9 Wing Gander, they departed later that evening en route to Prestwick, Scotland. After a mandatory crew rest in Prestwick, they were soon in the air headed for Gardermoen Air Station in Norway. Once they were on the ground it took about two hours to load all our equipment on a flatbed truck and two minivans. We were now on our last leg, heading for Hamar, which is a beautiful town with a population of about 35,000, and was the '94 Winter Olympics site for Speed Skating. After unloading our equipment at HIAS, I got the crew settled in for some much needed rest to counter the Jet-Lag. The next day we were busy setting up our equipment in the wash bay and preparing for the job ahead. 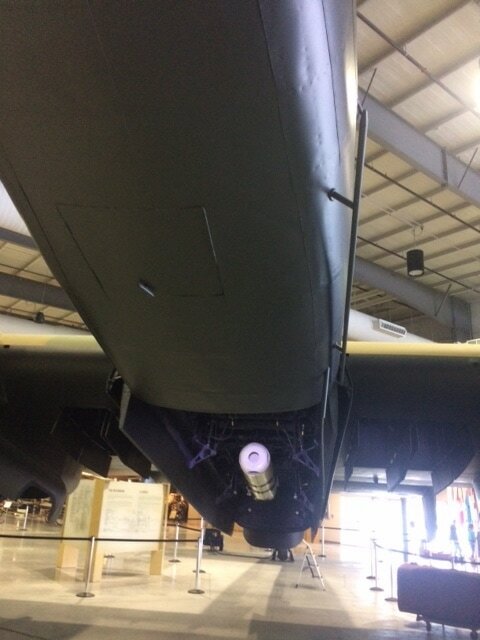 The Halifax was designed for fast assembly during the war years. This aided us in the disassembly process and during the next several days, everyone enthusiastically disassembled the tail section. The tail section had snapped off cleanly at a main bulkhead but sustained a lot of damage to the right-hand horizontal stabilizer. The left-hand vertical stab was completely gone, but the right-hand was recovered and will be used as a template for the manufacture of a left-hand stab. From the outset it was obvious that the "Halie" was going to take a lot of cleaning to meet Agriculture Canada guidelines. After over fifty years in the water, it had accumulated about four inches of mud throughout the tail section. During the cleaning process this was all sifted for remnants of any aircraft parts and ammunition. Approximately 500 shells, several flares, the four rear turret guns and several other artifacts were found in the tail section including the tail gunners’ coffee thermos. One of the most memorable moments of this trip was meeting Mr Thomas Weightman. He was very emotional when he entered the wash bay. I'm sure he was filled with memories of that dreadful night out on the icy waters of Lake Mjøsa. A few days later Mr Weightman was presented with his coffee thermos at a dinner by Karl and Jeff Jefferies, the President of the Halifax Aircraft Association. It had stayed with the Halie all that time and was recovered after the tail was brought to HIAS. Over the next two weeks the DACON Salvage Team experienced several delays due to weather and technical difficulties. We used this time to get well accustomed to the local restaurants and other establishments in the town of Hamar. Although there were still some administrative details to keep up with (paperwork for me), many members of the crew also had a chance to go south to OSLO, north to Lillehamar and east to a golf course at Elverum. Almost everyone in Norway spoke surprisingly good English and the countryside is very similar to northern Ontario. Finally on 5 Sep. the Halifax was raised from the deep where it had lain for the past fifty years. On the 9th, the Halie was towed ten kilometres, from a shallow bay close to where it was raised, to the beach at HIAS. The Canadian Ambassador, Mr. Francois Mathys, came to HIAS to meet the Recovery Team and was host to a luncheon at the plant to mark the occasion. There were representatives from the Norwegian Government and British Embassy present as well as many local dignitaries. The next day the Halie was brought to within 50 feet from the beach where we would eventually complete the remaining work. It was here, with the lower half of the fuselage still submerged in the cold water of Lake Mjøsa, that a preliminary search was made for artefacts and any of the pyrotechnics that we knew were on board. It was also our first opportunity for a member of the DACON Salvage crew and myself to carry out a thorough search for the Flight Engineer, F/Sgt Basset, the only member of the crew who remained unaccounted for after the crash. In preparation for the possibility of finding the remains of F/Sgt Basset, arrangements had been made for a committal service, to be held at the War Grave site at Lillehammar, where he would have been laid to rest with the other four members of the crew who did not survive that terrible night. This search however, as well as the preliminary search carried out underwater in the shallow bay, did not find any trace that he was or had been on board the aircraft when it sank. To be completely certain though, even the mud from the fuselage was sifted in order to find any trace of him, once the Halie came ashore. The attempt to bring the Halie ashore had to be abandoned when a support from the skid was damaged during the pulling process. While still in the water, we rafted out to the plane and hand pumped the remaining oil and fuel that was still in the tanks after 50 years. After several more attempts using 50 tonne cranes and a trio of large excavators, the Halifax was finally brought ashore late in the evening of 14 Sep. The real work for us could now begin, and over the next 18 days we busted our butts in good weather and bad. Our coveralls became caked with mud, oil and rust within two days. On one sunny day the wind was so gusty it blew our shelter tent into the trees, so much for the tent mooring skills of the Air force. Each day saw new challenges and problems to overcome. Over 90 percent of all the access panel fasteners were rusted, therefore regular tools were useless and the tool of choice was the hammer/rivet gun and chisel. I split the crew into two shifts and we began the arduous job of disassembling the Halifax. While half of one crew was taking apart the aircraft, the remainder were at the wash bay scraping, brushing, spraying, packaging, tagging and building crates. Everything had to be broken down small enough so it could fit inside the CC130 Hercules. All the major parts were moved approximately 200 metres by forklift from the beach to the HIAS plant. The forklift driver had to do some tricky manoeuvring to get the larger parts around several big trees. The largest part, the centre fuselage section, required two forklifts working in unison and took almost one complete day to bring up to the plant. Towards the end of our mission, a BBQ was organized by Mr Odd Gaarde, the HIAS Plant Manager and his staff. He explained the background of one of the traditional Norwegian foods and liquere, ROCK FISK & ACQUIVIT. The ROCK FISK was aged raw trout and the ACQUIVIT was very similar to Drambui. By the end of the night everyone (except the designated driver) had let their hair down and represented Canada in fine Air Force tradition. SKOL was the word of the night. During our last week and a half, we moved over half a dozen trailer loads of Halifax parts to Gardermoen Air Station. The tail section was brought to Trenton in mid September by a crew from 426 Squadron based at 8 Wing Trenton. 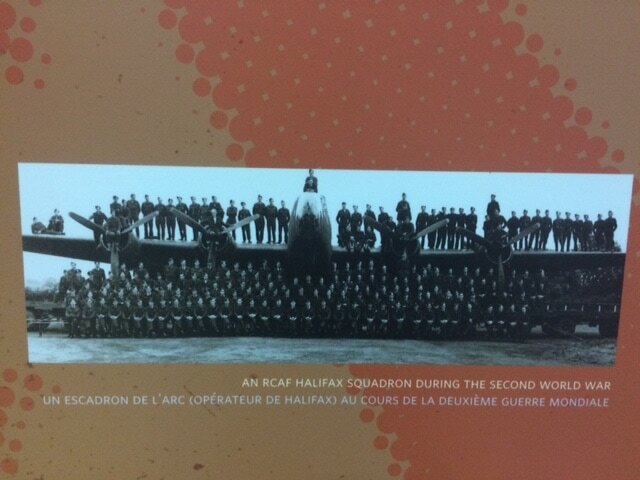 During the war 426 Squadron flew the Halifax as part of #6 Group (RCAF). The rest of Halifax NA337 took its last flight, courtesy of six ATG and one Royal Norwegian Air Force Hercules airlifts which continued through November to mid December 1995. 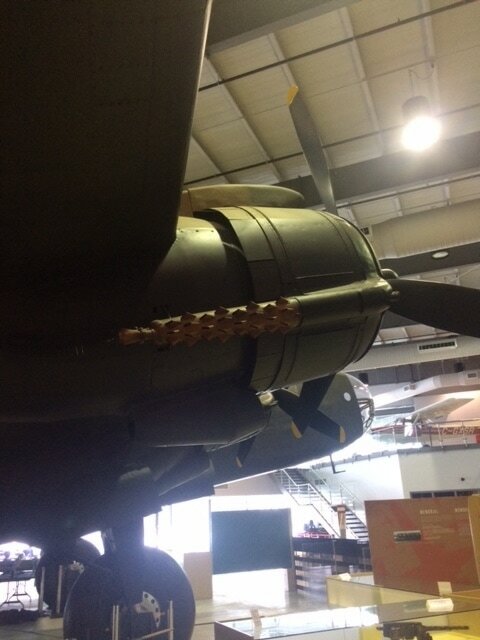 Halifax NA337 was used specifically for dropping supplies to Milorg, the Norwegian resistance movement. Every day until the last part was moved off the beach, people came to watch us work and took great interest in our day by day progress. Many elderly people told us stories about the occupation years or asked us questions and teachers from the local schools brought their classes to see a part of history. Most people we spoke to knew someone that was involved with Milorg or who had trained at “Little Norway”. Little Norway was located in and around what is now Toronto Island Airport. Everyone we met was extremely friendly and very proud of their historical association with Canadians. By the time we left Hamar we had given out several hundred Canada Flag pins, and all the patches, decals and various other mementoes we could part with. Everyone on the team gained something from this experience. Whether it was through conversations with the War Veterans, new friends made in Norway or the opportunity to work on a WW II Bomber. There were certain moments or events for each of us, which made us all proud to be Canadians and to be able to play such an important part in preserving our Military Heritage. For myself it was talking to the veterans and the general public who came to visit us each day. Their interest in the Halifax and where it was going made me realize just what a wonderful country we have. We really are the envy of much of the world. In closing, from the initial planning, to the time when the last piece was moved to Gardermoen ready for transport back to Trenton, this was without a doubt the most challenging and rewarding assignment of my career. s. Medical- Three members of the Recovery team had minor medical problems which were dealt with at the local medical clinic at Stange and Hamar. The following is a list of the significant issues and events which took place during the Halifax Recovery project. 11 Aug -Myself and Col White drive to Hamar to meet with Mr Gundersen from DACON, Mr Gaarde from HIAS and Mr Marsoe to discuss project and to determine suitability and availability of facilities. -Drove to Gardermoen Air Station to meet with Maj Klingenberg and Maj Glenne to discuss level of support available from Gardermoen and confirmed storage of Halifax and assistance in loading and unloading. 12 Aug -Tail section raised an held in the shallow bay at Gjøvika. 15 Aug -Pick up Mr Kjarsgaard at Fornbeau airport and drive to Hamar to meet with Mr Marsoe. -Drive to a small bay near Stange to see the tail section raised from the lake. -Tail section is driven to HIAS for storage. -Accommodation arrangements confirmed for recovery crew in Hamar. 16 Aug -Obtained clearance for revised crew list from Norwegian Defence Ministry. 17 Aug -Met with Col Gullan, the British Military and Air Attache’ and Mr Kjarsgaard to discuss details of handling the remains of F/S Basset if they were found. -Letter of agreement between the RCAF Memorial Museum and the CF signed. 22 Aug -Travel to Gardermoen to meet Recovery team. Arrival delayed by 24 hours. Met with LCol Karlstad the CO of the Maintenance Squadron. -Transport personnel and equipment to Hamar and off-load equipment at HIAS. -Main section of Halifax was due to be raised today. Delay due to unfavourable wind and wave conditions on the lake. 24 Aug -Get equipment set up and start work on tail section. 25 Aug -Remove horizontal stab, continue cleaning, tagging, preserving and crating of parts and pieces. -Remove two possible incendiary devices and one explosive device from tail section. Contacted Maj Glenne for name of EOD specialist from Norwegian Army. Devices set aside in a safe location. -Numerous .303 rounds recovered. Maj Glenne takes them to make them safe and restore them. 26 Aug -Clean interior of tail section and complete preparation of other pieces. 27 Aug -Complete cleaning of interior of tail section. 28 Aug -Weather conditions still unsuitable to attempt raising of main section. -HIAS has made an office available to me with a phone, fax and a computer. -EOD specialist arrives and takes devices to beach and blows them there. -Tail section is palletized and ready for transport to Gardermoen. 29 Aug -Estimate minimum 5 Herc loads to transport bomber back to Canada. -Condition of tail section indicates that it will take many years to restore the Halifax to display condition. -Another attempt to start raising the Halifax cancelled due to weather. 30 Aug -Tail section transported to Gardermoen. 01 Sep -Received fax from 426 Sqn Ops requesting assistance in obtaining accommodations and technical support from Gardermoen. Called Canadian Embassy in Oslo and they booked rooms at a local hotel in Gardermoen. Called Capt Ossen at Gardermoen Ops and confirmed support as requested. Faxed 426 Sqn info. -The weather is good for an attempt to raise the Halifax, however during the attempt the ROV becomes tangled in the lifting cables and the attempt must be delayed until a second ROV can be brought to the dive site to free the first. 03 Sep -The ROVs are recovered and repairs are made. However, the lifting device is not in the proper position to lift the Halifax and after several attempts to correct this situation they call in a tug boat to assist. 05 Sep -Made some final arrangements regarding the reception to be held at HIAS which will be hosted by the Canadian Ambassador. -Lifting device is now positioned properly and the raising operation begins about 2000 hrs and is successfully completed about 0530 the following morning. 06 Sep -Halifax secured in the shallow bay near Stange. An initial search for F/Sgt Basset is carried out with negative results. Preparations are made to position the Halifax in a more suitable position to tow it to the beaching site at HIAS. -Completed arrangements for the Ambassadors reception at HIAS. Everything will be in place, all we need to know now is when the Halifax will come ashore and the final number of people attending. 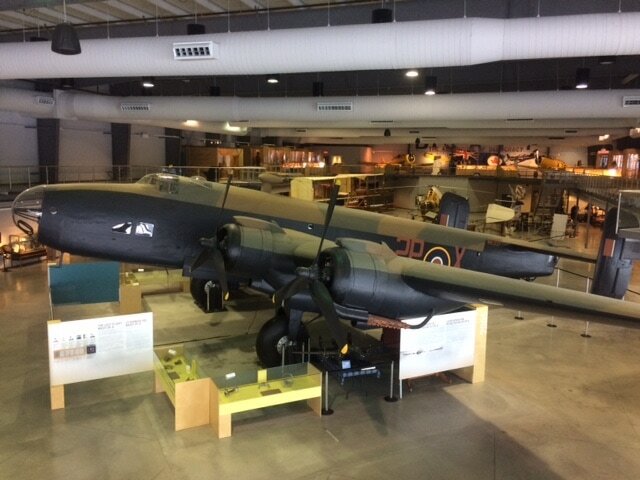 08 Sep -Halifax is repositioned in the lifting device to allow for towing to HIAS and proper mating of the sledge on which the Halifax will be taken ashore. 09 Sep -Halifax is towed to HIAS, but is not ready to be taken ashore. 10 Sep -The first attempt to bring the Halifax ashore. During the operation of pulling the Halifax to shore, it was necessary to follow a zig zag course in order to avoid several large rocks in the bay. The stress of changing directions several times was too great for the supports of the sledge on the port side, and they twisted. The attempt had to be abandoned when the Halifax was half out of the water and within 50 feet of shore. -Herc from 426 Sqn arrives at Gardermoen to pick up tail section. Sgt MacFarlane met them to give them info regarding the load. 11 Sep -A through search of the Halifax interior is carried out by the DACON personnel, assisted by myself. No trace of F/Sgt Basset was found. I contacted Sgt Fenlon, the aide to LCOL Gullan, at the British Embassy, and gave him the news that the search results were negative so that they could inform the family. I also told him that when the Halifax was ashore, we would search through the mud to see if any trace of F/Sgt Basset, no mater how small, might be found. -Several flairs and smoke bombs are recovered and placed in water for safety. EOD personnel called. -I had several discussions with DACON on the best way to take the Halifax to shore. They wanted us to remove the wings where it was, but I assured them that this was not feasible. No firm decision was reached at this time. -426 Sqn Herc departs for Trenton with tail section. 12 Sep -DACON decided to put in over 20 large truck loads of crushed rock to form a base for three front end loaders, one on each wing and one for the nose section, to try to lift the Halifax and bring it to shore. -The recovery team started to pump out the fuel and oil from the tanks into 200 litre drums. Not much else we could help with. -First attempt to lift Halifax to shore fails. Loaders lacked the capacity to lift it. 13 Sep -Two more loads of crushed rock! Second attempt to lift the Halifax is with a 50 ton crane. Bed proves to be too soft and the cane has insufficient lifting capacity with boom extended. 14 Sep -More crushed rock!! The third attempt to lift the Halifax is similar to the first, except that one small and two larger excavators are used. With some difficulty this attempt succeeds and the Halifax is brought ashore about 2000 Hrs local. 15 Sep -Work starts on dismantling the Halifax. Despite the cold and rainy weather there are lots of people at the beach site. In fact there are so many at times that it is a bit of a problem, as they routinely ignore the barrier tape set out to cordon off the area. I spend a lot of my time politely asking people to move back, talking to bystanders and to media personnel. -The underside of the fuselage is quite badly mangled and the spars of the mid wing section on the stbd side may be broken. A closer examination once it is dismantled will tell for sure. General condition seems on par with tail section. -The crew has removed the mud from the crew rest/crash position of the Halifax as well as the forward section, and strained it through a coarse sieve. Some artifacts were found, but there was no trace of F/Sgt Basset. I called Col Gullan at the British Embassy and passed on this final word to him. 17 Sep -The engines and flight controls have been removed and the work is proceeding well. 18 Sep -The outer wings have been removed. -Have made every effort to pump out any fluids remaining in all tanks and use buckets to catch any fluids draining out when lines are cut. Any spills that do occur are cleaned as well as possible. -Removal of trailing edges and fuel & oil tanks are proving difficult and adding extra time to our schedule. We are also having to strip down the aircraft much more than I had originally planned due to the amount of mud inside everything and Agriculture Canada’s regulations. This is also adding time to our schedule, however work is still proceeding well. -I went to the Raufoss Munitions Test Centre with Capt Alf Øversveen and Capt Tom Tevnesveen of the Norwegian Army to dispose of the pyrotechnics recovered from the Halifax. 20 Sep -Halifax is lifted onto repaired and modified sledge in order to allow us access to the underside of the aircraft. 22 Sep -First load is sent to Gardermoen. -The interior of the fuselage is now virtually stripped of all equipment. Cleaning and packaging all the pieces continues to be a big job, otherwise work is going surprisingly quickly. -The crew attended a BBQ hosted by the people at HIAS this evening. The party was well attended and a great time was had by all. 23 Sep -A slow day for some as I think they may have had too much of the raw fish which was served at the party last night. -The port mid wing is removed. Work continues on removing such items as leading and trailing edges, fuel tanks, undercarriage mounts and misc fairings. 24 Sep -The stbd mid wing is removed. 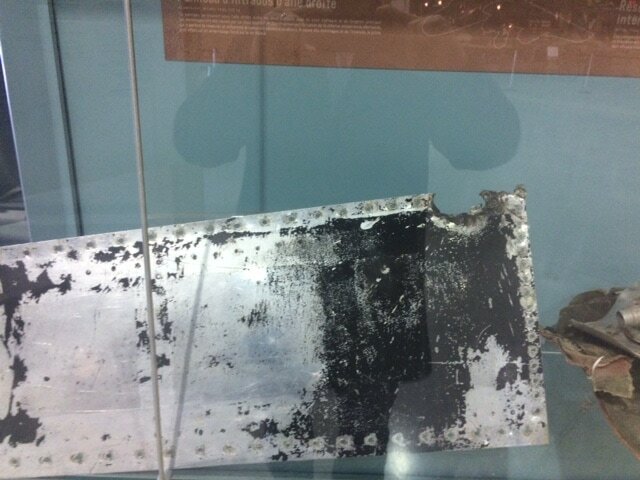 There is quite a lot of fire damage to the stbd mid wing. A good portion of it was destroyed, but the spars do not appear broken. 26 Sep -All fuel cells are now removed. The rear section of the fuselage is removed. 27 Sep -The front section of the fuselage is now removed and the trailing edges of the centre wing section are being removed. 28 Sep -All disassembly now completed. Final cleaning of fuselage sections, and preparation for transportation to Gardermoen is all that remains to be done at HIAS. -Second load sent to Gardermoen. 29 Sep -Third load sent to Gardermoen. Rear section of fuselage is moved from the beach to the work bay at HIAS. Cleaning continues. -Work starts on cleaning, packaging and preparing equipment no longer required, for shipment back to Trenton. 30 Sep -Rear section cleaning is finished. Centre section of fuselage is moved to the work bay for cleaning. 01 Oct -Centre section cleaning is finished. Front section of fuselage is moved to the work bay for cleaning. Preparation of parts for shipment to Gardermoen continues. -The only things left at the beach site are items that belong to DACON. -The beach site is cleaned of anything that may have been washed out of the Halifax or dropped on the beach. 02 Oct -Front section is finished cleaning. The fourth load is taken to Gardermoen. -Sgt MacFarlane and three others go to Gardermoen to prepare shipment of Halifax for air transport. -I take the train to Oslo to deliver some papers and to thank the Ambassador, Col White and the rest of the Embassy staff for their assistance. 03 Oct -The fifth load on the regular truck and trailer is taken to Gardermoen. -The three fuselage sections are taken to Gardermoen on a low-boy trailer in two trips. 04 Oct -Sgt MacFarlane and three others go to Gardermoen to prepare shipment of Halifax for air Transport and meets the Herc from Trenton. Picks up plaques from the aircrew. -Remainder of crew makes final cleanup of work areas at HIAS and on the beach. 05 Oct -I present plaques to Mr Gaarde and Maj Glenne in appreciation for all their assistance. -Recovery Team departs Hamar for Gardermoen. Bombay equipped with drop canister for Resistance supplies. Section of fuel tank that was hit by antiaircraft fire, bringing it down. 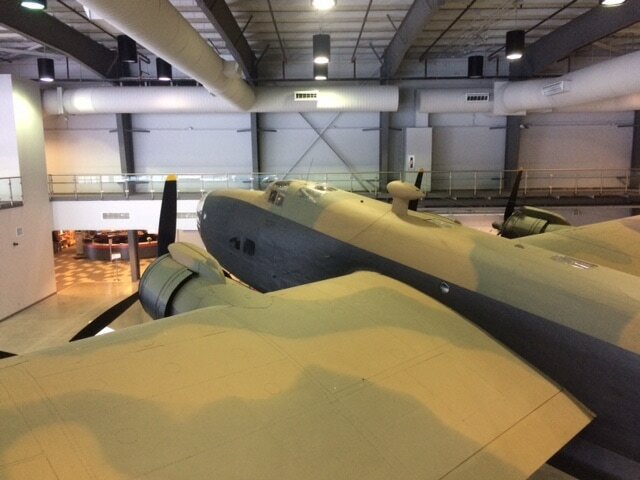 The completely restored Halifax on display in Trenton.